Atlantic Pump distributes A-C Pump products for municipal water, wastewater, flood control, and industrial uses. These include a wide range of non-clog, splitcase, vertical column, and axial flow pump solutions. For local inventory and support for A-C Pump products, Atlantic Pump is available as a factory-trained, stocking distributor. A-C Pump, a division of ITT Industries, has a long history in pump manufacturing. The division has its origins with the Edward P. Allis & Company, which built the world’s largest centrifugal pump in 1884. Eventually the company became Allis-Chalmers Pump, which was purchased by ITT Corporation and renamed the A-C Pump line in 1988. In 1996, ITT also acquired Goulds, and in 2011 the A-C Pump products became part of ITT’s Xylem spinoff. Today A-C Pump, part of the broad line of Goulds Pumps, is one of the fluid businesses of ITT Industries. Atlantic Pump distributes A-C Pump products throughout Maine. Atlantic Pump has factory authorized maintenance facilities for A-C Pump products. This ANSI Standard Dimension Process Centrifugal Pump set the industry standard. It features a fully open impeller, high and low temperature capability, seal flush pans, dynamic seal to eliminate sealing problems and reduce maintenance, and options for baseplate mounting. This lined slurry pump is the next generation in severe-duty slurry pumping, featuring a trademarked vibration and bearing temperature monitor, an impeller release collar standard on all sizes, and a choice of either expeller or mechanical seals. Double suction pumps are available with a range of options in small, medium, large, and extra large capacity. The small capacity, single stage, double suction pumps are suction/dual volute pumps with radial and axial balance for long life with minimal maintenance, and also feature a horizontally split casing. Flows to 8,000 GPM. The medium capacity double suction pumps, available in a wide variety of metals, feature a double suction impeller, wear rings, and a horizontally split casing. They can be installed with horizontal or vertical mounting, clockwise or counterclockwise rotation. Flows to 12,000 GPM. The large capacity double suction pumps are available with sleeve bearings and either grease or ring oil lubricated bearings, and dual volute casings are standard on all models. Flows to 65,000 GPM. Extra large capacity double suction pumps come with optional features such as bottom suction, packing or mechanical seals, and sleeve bearings. Flows to 225,000 GPM. A-C Pump’s heavy-duty lined chemical pumps are designed specifically to handle corrosives that require a lining with the universal corrosion resistance of PFA. The sealless design is a more effective alternative to pumps with mechanical seal problems. These pumps meet the strictest EPA regulations. These process pumps are designed with a shaft size and overhang that provide maximum seal and bearing life. The need for field alignment is eliminated due to precision fits that provide built-in alignment between pump and motor. Hydraulic and mechanical loads are carried by the pump rather than special motors. A-C Pump’s single stage, enclosed impeller, back pull out process pumps are designed for abrasive slurries. These pumps efficiently pump liquids with abrasive solids in suspension. Some models handle both air and solids. This heavy duty process pump handles tough process pumping applications with excellent hydraulic coverage, high efficiency, and extreme ease of maintenance. Capacity up to 40,000 GPM. Severe duty slurry pumps are designed for the most abrasive slurry applications, and also for extreme safety and ease of maintenance. A heavy duty bearing frame and shaft, extra thick wall sections, and easily replaceable wear parts extend service life under the most severe operating conditions. A-C Pump’s SRL model is a rubber-lined slurry pump. The SRL is available in a wide variety of natural and synthetic elastomers, and with multiple impeller options. This severe duty slurry pump also features heavy duty design and extra thick liners. Trash Hog® is designed for superior solids handling capability, optimum pump performance and extreme ease of maintenance. These pumps are designed to handle raw sewage, sludge, debris, or plant waste in many applications. HS and HSD horizontal hydro-solids pumps eliminate clogging problems of conventional centrifugal pumps. 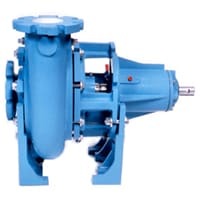 With a recessed impeller design, these pumps can handle large particle solids and fibrous/stringy materials. Any spherical solids up to 10 inches that enter the suction will pass through the discharge.